Hanoi is famous with the old town (phố cổ) which is near Hoan Kiem Lake. Along with the name "old town", everything here seems to be "old". Hanoi was 1000 years old in 2010. Houses in the old town are tiny. Even the hotels are small, too. The buildings are allowed to have 5 floors only. People said that in some areas, they couldn´t see the light during the daytime. Eating in Hanoi is not difficult because there are many places for eating from big restaurants to small vendors. However, eating well is not that easy. We went to many places and some of them are expensive but the food are not value for the price. Recommended by a person from the hotel, we went to Yin & Yang restaurant which is located in 78 Mã Mây street (near Hoan Kiem Lake, see Hanoi city map). The first impression was not very good because it was empty (but yes, it was 9:30pm already). We entered and the waiter was very polite and friendly. We ordered but we didn´t expect the food would be fantastic. By waiting, we looked around the restaurant. There are two rows of chair. Some of them are sofas which are very nice in red color and comfortable with soft material. For a long day working, sitting here is a good idea. There are tables for 2 people, 4 people and so on. We also can hold a small party here. For the hot weather like in Hanoi this time (summer), Yin Yang has air condition so that you will feel relax. The food came in beautiful decoration. The leaf-form dishes make the food more attractive. However, the most important is the food: it is really good! We had the chicken wings that they did it nicely outside and delicious taste. The beef was also outstanding. One more thing is the manager here. His name is Long. 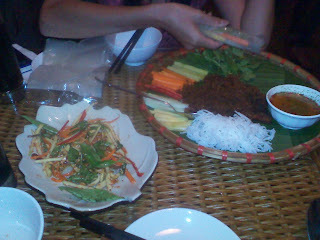 He came to the table which was next to us to show the guests how to make spring roll. Then he talked to us. He´s a very friendly man who can speaking English very well. He told us the restaurant is quite new. They opened 2 months ago, meant April 2011. We talked to him for a moment and promised to come back. And in fact we really want to come back. We returned there the next day. This time we had fish and pork. They were also great again. Long invited us to drink a kind of Vietnamese wine. How nice he is! Yin&Yang is one of the best restaurants we have ever been to. The location is good, the food is delicious and the price is reasonable. Once when you come to Hanoi, don´t miss this great restaurant YIN & YANG.